These GE Hydrowave line of washers, example model numbers WPRE6100 and WHRE5550K, use an inverter board to vary the speed of the motor. Instead of transmission, it uses a mode shifter. More on both of these later. One of the common failure symptoms in this machine is that the agitation cycle gets messed up but the spin and drain continue to work normally. During agitation, you may hear a loud howling or clunking noise or the tub may be rotating with the agitator, causing overflows. The direction of the tub rotation during agitate may change between lid openings. All of these are indications of a bad Mode Shifter. The shaft and mode shifter assembly consists of the shaft and tube, mode shifter cam, and mode shifter coil. It operates in 2 distinct modes, spin and agitation. The shaft and tube transfers power to the wash system. Motor power is transmitted to the shaft and tube from the drive belt to the drive pulley. The drive pulley is attached to one end of the agitator shaft and the agitator is attached to the other. The tube is fixed to the washer basket at all times. The mode shifter changes the shaft and tube from spin to agitation. 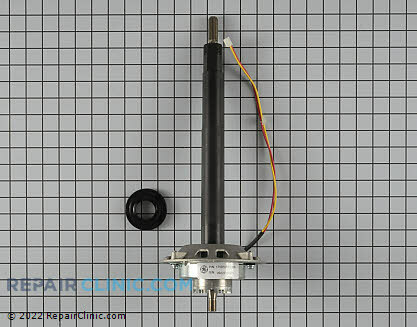 In agitation mode, the tube is fixed to the platform and the agitator shaft rotates freely. In spin mode, the agitator shaft is fixed to the tube and both rotate together. Mode shifter coil energized for agitate mode; cam teeth disengaged from drive pulley. Mode shifter coil de-energized for spin/idle mode; cam teeth engaged in drive pulley. The mode shifter is controlled by the motor inverter circuit. When the washer starts the agitation cycle, the inverter energizes the mode shifter coil. The magnetic field of the coil lifts the mode shifter cam, disengaging it from the drive pulley. Without the cam engaged, the drive pulley rotates only the agitator shaft. At the beginning of the agitation cycle, the inverter energizes the mode shifter coil with 135 VDC (PWM) for approximately 18 seconds. This high voltage pulls the mode shifter cam up from the drive pulley. During this time, the motor also rotates clockwise and counterclockwise in short strokes to ensure the mode shifter cam has been released from the drive pulley. This operation is called the Mode Shifter Agitate Program. It is normal to hear metal-to-metal “clunking” sounds during this time as the cam and drive pulley disengage. The washer runs this program when the agitation cycle first starts, when power is restored if lost during agitation or when the user restarts the washer if paused. Once the Mode Shifter Agitate Program has completed (18 seconds), agitation begins. During agitation, the inverter continues to supply 30 VDC (PWM) to the mode shifter coil. This voltage is sufficient to hold the mode shifter cam away from the drive pulley throughout the remainder of the agitation cycle. The inverter motor controls the speed of agitation. The agitator stroke rate is approximately 30 strokes per minute. This rate is the same for all cycles. The speed of the motor controls the arc. At fast speed, the arc is approximately 360 degrees. At slower speeds, the arc is substantially less. It is the distance of the arc that determines normal or gentle wash cycles. to make certain the mode shifter cam is engaged with the drive pulley. The inverter does not supply voltage to the mode shifter coil during this sequence. Since the coil is not energized, the spring loaded cam drops down into the teeth of the drive pulley. to ensure the cam has engaged with the drive pulley. This 30 second operation is called the Mode Shifter Spin Program. It is normal to hear metal-to-metal “clunking” sounds during this time as the cam and drive pulley engage. If the washer is paused while in agitation, it is NORMAL to hear sounds for an additional 30 seconds as the inverter control runs the Mode Shifter Spin Program to de-energize the coil and enter a pause state. If the washer is in agitation and power is lost, the inverter control will run the Mode Shifter Agitate Program when power is restored. If the washer is in spin and power is lost, the inverter control will run the Mode Shifter Spin Program when power is restored. To help prevent out-of-balance conditions, the last 10 seconds of agitation on certain cycles will be short, fast strokes to help redistribute the clothes load prior to entering the spin cycle. Most of the problems we see in the field with the Mode Shifter are electrical rather than mechanical. The Mode Shifter has a coil inside of it with a two-wire harness, a red and yellow wire, that supplies power to the coil. The most common failure is that the Mode Shifter coil burns out, reads open on a continuity test. Disconnect the red/yellow wire harness and use your meter on Rx1K and check continuity. If it’s open, replace the Mode Shifter assembly. Return policy on all parts purchased through this website is 365-days. Even on electrical parts already installed. This entry was posted in Washer Repair on June 28, 2011 by Samurai Appliance Repair Man.